The Diocese of Brentwood has published its Vision for the future renewal and restructuring of the diocese in Essex and East London. The document, entitled Vision Document: Shaping Our Future, was published and distributed to parishes to coincide with the beginning of Advent. It is the fruit of much work and consultation in the diocese about renewal and restructuring through the Stewards of the Gospel process. The plan aims to maximise the opportunities for evangelisation, sacramental provision and putting faith into action through charitable works across the diocese, given the resources available in decades to come. Here Bishop Alan talks about the future. Born in Lancashire in 1951, Alan Williams trained for the priesthood at Allen Hall before which he obtained a Degree in Natural Science from Durham University, a Degree in Theology from the University of Cambridge, a PhD in Psychology from London University and a Masters Degree in Education from the University of Hull. Bishop Williams previously served as Director of the Roman Catholic National Shrine at Walsingham where he had overall responsibility for pilgrimage and retreat work. He also served as parish priest at St Lawrence of Canterbury, Sidcup. 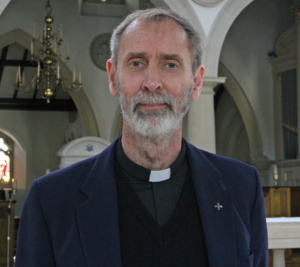 He is a former Major Superior of the Marist Fathers in England, a post he held from 2000-2008 and has also served as a school teacher and chaplain in secondary schools and Catholic chaplain at Sheffield Hallam University. He has also taught Christian Spirituality at postgraduate level. Consecrated 1st July 2014 by Cardinal Vincent Nichols.